Mahr’s Brau | Beer Apprentice - Craft Beer News, Reviews, Interviews and Info. Hi guys. 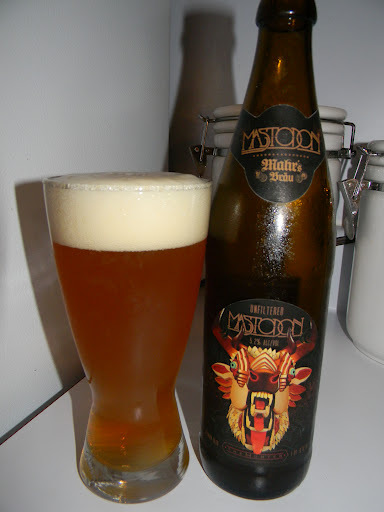 For today’s craft beer review I’m going to be trying Mastodon (The Hunter) produced by Mahr’s Brau located in Bamberg, Germany. I don’t really know what to expect from this brew. Even though I have listened to the band Mastodon for several years I had actually never even heard of this beer until I saw the bottle. The label looked cool enough, so I picked one up and decided to give it a test drive. The website, mahrs-braeu.de, is still under construction, yet I was able to find a cool little description from ratebeer.com. Let’s be honest: You’re probably more likely to take illegal substances while you listen to the heavy metal band Mastodon. But Mastodon and their crew had the opportunity to get shitfaced legally while they were playing the recent Sonisphere stop in Hockenheim, Germany on Saturday. Stephan Michel of Mahr’s Brau brewery created a limited edition Mastodon Premium Lager that was handed out to Mastodon and their crew at the show. They were reportedly “swallowing”. This brew comes in a 16.9 oz. bottle and it has an ABV of 5.2%. It poured a hazy orange to light amber color. Some bright, burnt orange and yellow highlights were shown around the edges when held toward a light source. The head was off white, sized nicely, smooth, soft and kind of creamy. The retention time was just ok and lacing was mostly “so-so”. The nose smelled crisp and clean. A fragrance of grain and grassy hops dominated at first. They were soon followed by white bread and wafer notes, which eventually gave way to a fruity pear aroma. Not too bad really. Nothing too complicated or elaborate though. Pretty straight forward. The taste was nearly identical to the smell. Crisp, clean crackers and white bread touches. Plenty of graininess along with the expected grassy hops. A very light herbal quality was made known throughout the entire drinking experience. The hop bitterness was very low and the strength of the taste was rather subdued and easy going. The mouthfeel was medium bodied. Dry, soft, smooth, crisp and kind of refreshing. The carbonation was nice and lively and a decent amount of flavor was left behind after each sip. Well, this brew was solid enough. I don’t know that it quite holds the “oomph” and “punch” that the band provides, but it was still an enjoyable drink nonetheless. The drinkability was outstanding, and like most Pilsner styled beers it would fit perfectly with the warm weather of Spring and Summer. I’d drink it again for sure, but if you were to do a bit of taste testing with various beers of this style you may find that some of the others on the market exceed this one. It’s far from bad, but I didn’t really find anything extraordinary that would put the Mahr’s Brau Mastodon (The Hunter) above any other. With that being said, pick it up and give it a try. It may be the beer you been looking for. Be sure to leave a comment and tell me all about your opinion. Hello again everyone. I hope you all are enjoying your day. 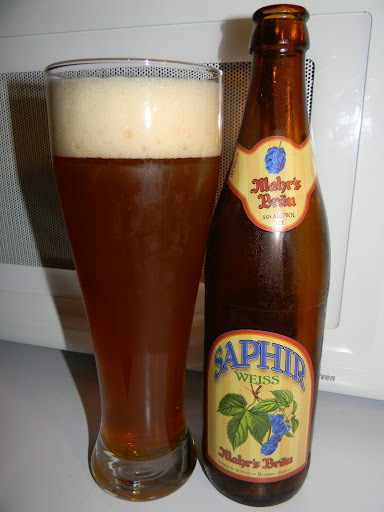 For today’s craft beer review I’m going to be trying the Saphir Weiss made by Mahr’s Brau located in Bamberg, Germany. I’ve reviewed a few of their other beers on here before, but I have yet to try the Saphir Weiss. The website, mahrs-braeu.de, is still under construction, so I don’t have a commercial description for you today. That’s ok with me though, we can just find out for ourselves what this brew is all about. The Saphir Weiss came in a 16.9 oz. bottle and it has an ABV of 5.6%. It appeared a very cloudy, amber to caramel brown color. Some burnt orange highlights were shown around the bottom of the glass. The head was slightly off white, smooth and just a tad soapy. The size was decent, the retention time “ok” and the lacing was passable. The nose brought forth plenty of wheat bread and yeasty characteristics. Hints of fruity banana and red apples too. It was quite earthy with just a slight hop presence. I also found it to have a tiny bit of a buttery essence. Essentially, not too bad. Nothing out of place and it seemed to be balanced fairly well. The taste let the bananas and apples come forth a touch more. The wheat breads and spicy cloves really coalesced well with one another I thought. The hops were light and earthy while retaining a low bitterness. Some yeasty aspects were noticed throughout the entire drinking experience. The combination of the wheat bread and yeast really made for a taste that was a lot more malt forward than what I had anticipated. Like the aroma, pretty good while maintaining a nice balance. The mouthfeel was medium bodied. Smooth, somewhat dry, crisp and kind of refreshing. The carbonation was good and an ok amount of flavor was left behind after each gulp. Most noticeably the cloves. Overall, I thought the Mahr’s Brau Saphir Weiss was a solid beer. It’s very easy drinking while having enough complexity to warrant some discussion. I didn’t mind drinking it and would have no problem downing another bottle that’s for sure. I feel it’s geared more for warmer weather, but it’s thick enough and malty enough that it could be enjoyed during the Winter months also. Sure, I’d suggest you give this a try if you see it. I doubt that I would go out of my way or anything, but if you see a bottle on the shelf, pick it up and give it a go. You may very well find it to be an outstanding brew. Be sure to let me know what you think of it if/when you give it a test drive. Well, it’s time for another craft beer review guys. 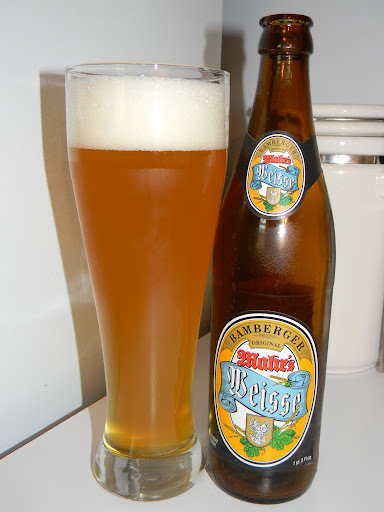 For today’s tasting I’m going to be trying the Mahr’s Weisse produced by Mahr’s Brau located in Bamberg, Germany. This is another brewery that I have just recently started to get in my area, so I haven’t really made up my mind on what I think of the brewery as a whole. Only one way to find out I guess. The website, mahrs-braeu.de, is currently under construction, so let’s just try the beer and see for ourselves what it’s like. This beer comes in a 16.9 oz. bottle with a 4.9% ABV. It poured a very cloudy orange to yellow color. A very white head was produced from a medium aggressive pour. It was adequately sized, frothy, creamy and soft. The retention time was only average and the lacing was somewhat substandard also. The nose gave a big shot of banana along with a sturdy hints of wheat and grain. I found spices of coriander and light notes of pepper and cloves. Touches of orange zest hid underneath along with a bit of bubblegum. It was quite fresh and fitting for the style. The banana was a little more relaxed in the taste. It seemed to have stronger aspects of wheat and fresh grain though. The coriander was harmonized very well and again, just a slight smattering of pepper and cloves. Little to no bitterness was found and the orange savors were quite meek. The mouthfeel was medium/thin. It was crisp, snappy, smooth and a touch watery. It was very thirst quenching and refreshing, but the flavor vanished rather quickly after the swallow. Overall, this was a decent beer I thought. It definitely falls in line with the Weisse style. It’s predominately proper and enjoyable. It’s super easy to drink and exemplifies a perfect Summer quaffer. I would recommend giving it a try if you are making your rounds through Hefeweisse territory, however, in my opinion, it’s not quite as good as some of the others out there. It still has enough character and personality to keep a drinker interested throughout however. So, the next time you see the Mahr’s Weisse, pick up a bottle and give it a try and let me know what your thoughts of it are.